Mercier-Jones blendsMercier-Jones blends cutting-edge hovercraft innovation with luxury, high-performance supercar technology, resulting in the world’s first Supercraft™. Mercier-Jones blends the future of hovercraft innovation with cutting edge luxury high performance sports car technology, resulting in the world’s first Supercraft™. Elegant, fast, agile and easy to pilot; the 2015 Supercraft is an advanced amphibious vehicle certain to draw attention. 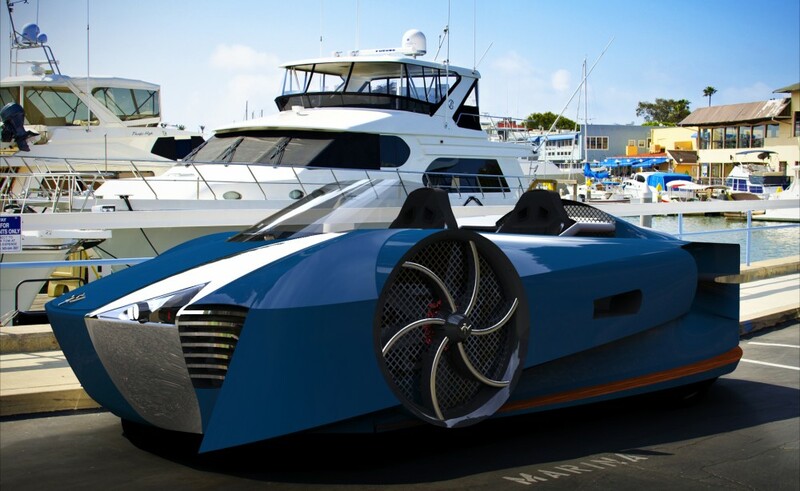 Mercier-Jones has designed a cutting edge, agile, and high-performance hybrid-electric hovercraft that is positioned to revolutionize personal transportation. The patent-pending directional control system makes the Mercier-Jones hover vehicle safer and easier to operate than conventional hovercraft therefore paving the way to search and rescue and even street legal versions in the not-so-distant future. The eco-friendly hybrid powertrain improves performance while reducing environmental impact and noise pollution. 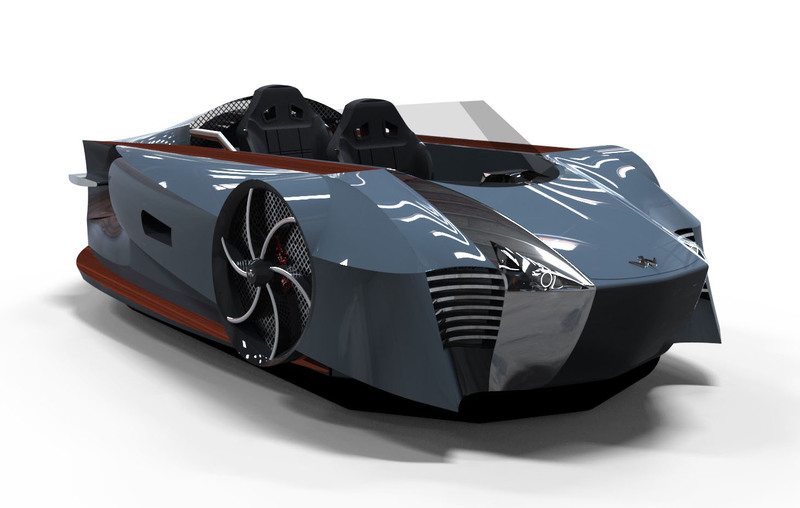 With support from key development partners Barger Tech Ltd., Indy Car builder JT Composites and others, this premium two-seater, supercar inspired hovering vehicle is now speeding to market. “To date, there has never been a more agile and easy to pilot hovercraft than the Mercier-Jones Supercraft, so we think we are going to attract a whole new demographic of hovercraft owners,” added Mercier. With features and designs inspired by the world’s elite supercars like the Audi R8 and Bugatti Veyron, the Supercraft is the car of the future you can drive really fast over land, ice, sand, water and everything in between. The World combined Luxury Goods Market for 2013 was almost $300 Billion annually according to Boston’s Bain & Company’s 2013 Market Study. Mercier-Jones will be striving to penetrate the luxury market by establishing a luxury brand that is high quality, personalized, rare and unique with a lifetime of over-the-top customer service. We anticipate Mercier-Jones will have no rivals in the present luxury vehicle marketplace. “I expect you will be seeing some version of our Supercraft in a major film release soon. It’s just too cool to not be in James Bond’s safe-house,” added Chris Jones, COO and Co-Founder. Current features of the handcrafted Supercraft include hybrid electric drivetrain; liquid cooled duel rotary engine; alternative fuel conversion packages for diesel, kerosene, ethanol, natural gas, bio gas, or propane; fly-by-wire control system; carbon-fiber body; light weight chromium alloy frame; halogen lamps; LED running lights; GPS navigation; Android driven cockpit display; Bluetooth and Wi-Fi connectivity; hands free phone integration; 4 speaker digital audio system with a sub-woofer option; custom made Formula One inspired seats; refrigerated personal drink wells; 6 color schemes including Gotham Night™; customized wood trim packages including teak, walnut, maple and zebrawood; and personalized monograms. Injector seats and rocket boosters sold separately. Founded in 2013, Chicago’s Mercier-Jones has patent pending technology in its revolutionary propulsion system and hybrid drivetrain, making it the most innovative hovercraft manufacturer in the world.